KoopaTV: Condiment Conflict: Mayonnaise vs. Ketchup Splatfest! Mayonnaise is gross. It's this thick, eggy cream. The colour is all yellow and... yeah, I don't like it. Tasteless lard is a good description. It has a crappy shelf life, too. 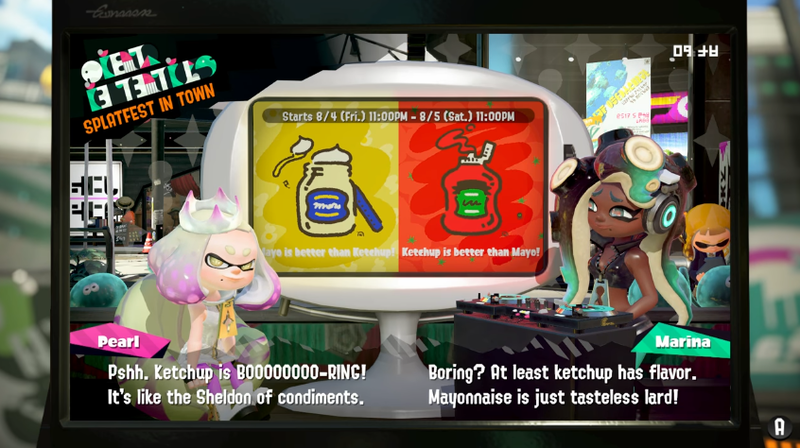 I don't understand how Pearl can make the point that ketchup is boring, and then advocate for mayonnaise. Uh, hello? Mayonnaise doesn't do anything but make things less dry and more smell. Plus, ketchup is guaranteed to win Popularity. If you have access to SplatNet 2.0, which you do if you have the Nintendo Switch Online application on a mobile device, go see what teams your Nintendo Switch friends are on. They should be overwhelmingly pro-ketchup. On the other hand, I do not trust mobile devices. Instead, I did a field test of a company cafeteria. They coincidentally had mayonnaise and ketchup baskets right next to each other. Left: Basket of mayonnaise packets. Right: Basket of ketchup packets. The ketchup basket was nearly empty, while the mayonnaise basket was nearly full. We can assume that, at the start of the day, the ketchup basket was full, and the mayonnaise basket was not refilled right before the picture was taken. You may challenge that assumption, if you'd like, but I think it's a safe assumption. Ketchup is just a lot more popular and a lot more splashable as a condiment on people's meals. Mayonnaise is a lot more specific in usage. Plus, ketchup is good for committing crimes in certain locations because certain prosecutors can't see red. ...How would you use ketchup in a crime? Well, be creative. What Argument Is There Against Ketchup? 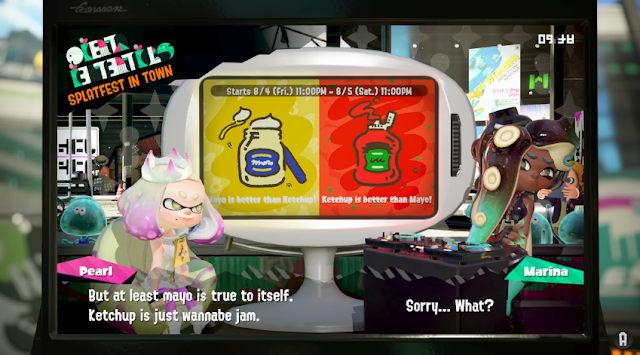 Pearl presents a bizarre argument in the news cast: Mayonnaise is true to itself, while ketchup is “wannabe jam.” A tomato jam — fruit plus sugar. ...So what? That's it? That's your argument? If that's true, does being a renamed jam make ketchup worse? No. It's just a deflection tactic away from the fact that mayonnaise isn't a very good product. There ain't a legitimate point to make against ketchup. You can even make puns off of it. What's the best mayonnaise has? Bayonetta-based puns? Pft. People don't even know how to spell mayonnaise. Those two 'n's really trip people up. But it's important to have two of them. Ludwig will be trying to get into Team Division matches for at least part of the Splatfest, since those have more weight in terms of affecting the result. (And they're possibly more fun with friends.) Which condiment do YOU support, and why? Also, if you would like to have an index article of all Splatfest-related content on KoopaTV, let KoopaTV know in the comments and the staff (aka Ludwig) can make it happen! The next Splatfest is Flight vs. Invisibility as a superpower you would like to have. This gets much more philosophical than condiments, at least. Team Ketchup lost badly, and Ludwig blames Marina for it. 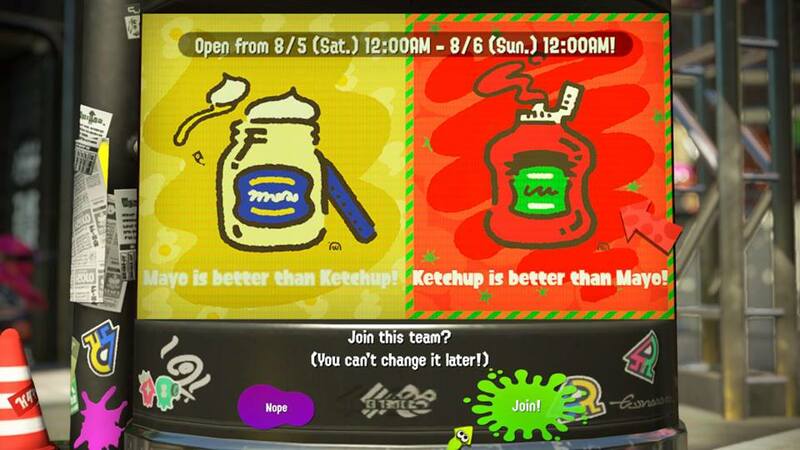 There is a sequel Splatfest of condiments, but this time it's for Salsa vs. Guacamole. What's the consistency difference between ketchup and salsa? Patrick and Mayonnaise, The Rocko's Modern Life Gag with a Jar of Mayonnaise for 10 minutes (not actual episode run time) for the Wacky Deli episode (and was used as an April Fool's Day joke by Nickelodeon) and apparently furries. I was in Ketchup by the way. "Ludwig will be trying to get into Team Division matches for at least part of the Splatfest"
That failed to happen due to a lack of getting 4 people. I can try to participate for next time if we are on the same team and my child lets me. All three regions had Mayo win. In Japan, Mayonnaise won Popularity and a skill category outright, while Europe was basically the same as America except for a more popular Mayonnaise. I just want to point out that Nintendo would report 50.1% as 51%. What is the source for rounding up decimals? Otherwise, they could possibly report a 49.9 to 50.1 as a tie and have no winner, even though one team did better than another. Clearly, they have no space/consideration for decimals to begin with. So, what would they do with the decimals? They'd ceiling them. It seems the cafeteria in your story has taken on the Splatfest law about winners being legally better. We must work to repeal this law at once. At least this was a Splatfest that I will not feel bad about missing. Surely there there will be more creative themes in the future when more people own a Switch or at least I hope. I'll write the Splatfest articles sooner than a minute before Splatfest starts if it's a theme that is worth influencing public opinion on. Nintendo of Europe twitter just announced a new Splatfest and the theme is superpowers which is do you prefer Flight or Invincibility? If the theme is going to be global again, I probably do not want to be on the same team as perverts so I am thinking about going into Team Flight. And now I get to be somewhat on honorary Team Planes. If you have a different opinion than me, be sure to convince me earlier with an early Splatfest topic. Also Pit dreams of being able to fly on his own. He would love to have that team win. Possible reasons you would be against flight is because the evil plumber utilizes some costumes to give him flight as well as force a poor Yoshi to fly for him. I don't particularly care about Pit's opinion, but this article would be written much sooner than minutes before the Splatfest starts since this is a good topic! But not sooner than the Splatfest actually being announced in-game.